We have found TMD to be a professional company who delivered a high quality website in the desired timeframe. Great service, Thanks Trent. Copyline is a South East Queensland company specialising in Toner, Ink and stationary supplies. 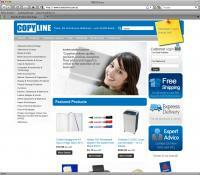 Copyline has over 20,000 line items that can be ordered by their customers. Copyline wanted to allow their customers to easily order these products online, however Copyline did not want to have to recreate or maintain these products online. Utilising a customised import system, TMD imports all products automatically from Copyline’s internal stock management system and populates the website with this data. Images can also be uploaded, and are automatically “matched” with the relevant data from the feed. Customers can then order via a traditional shopping cart. Copyline also has an offshoot www.bccopyline.com.au – which allows Bartercard customers to pay for half their order using their Bartercard and half using a normal credit card. This involved integrating with multiple payment gateways, and ensure that both cards can be charged accurately. In addition if one card fails, the first transaction would be rolled back automatically.